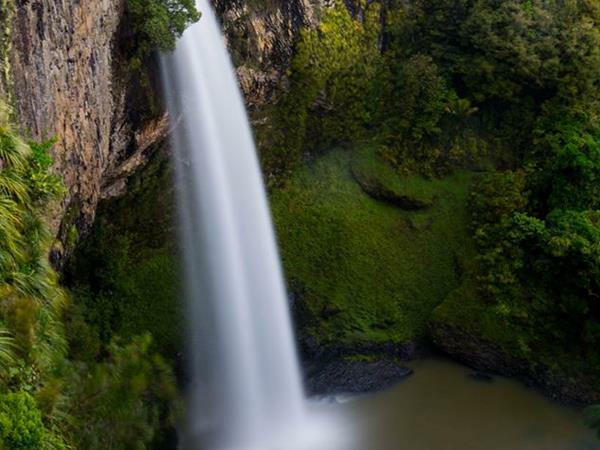 Just 15 minutes drive from Raglan; Bridal Veil Falls are 55 metres high and regarded as one of the most spectacular falls in the North Island. This is a great half day trip from your Raglan accommodation and a good way to stretch your legs too. Heading back towards Hamilton, Bridal Veil Falls are 15 kms off the main road and are well signposted. From the carpark an easy flat walk through native bush takes you to the top of the falls where you can see the fantastic views. A further 10 minutes walk down the steep but stepped path takes you to the bottom of the falls for an equally dramatic view. Click here to read more about your Raglan accommodation options at Raglan Holiday Park.